When starting a new job, in the job settings you have the opportunity to apply a Filter to it. 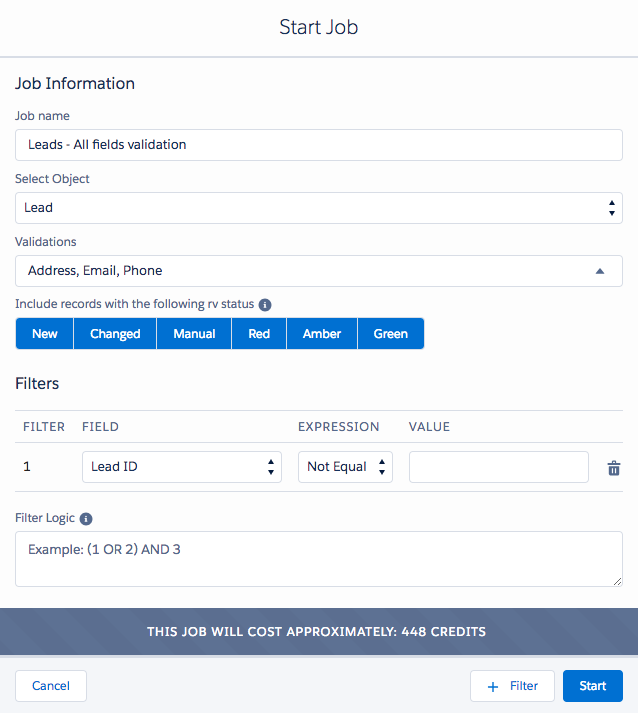 The Record Validation Job Filter can include or exclude any record based on a field value. The filter can be applied only before a job is started. Job selection The filtered records will be matched with the entire database. Matched Records The entire database will be matched with the filtered records. This may take some time. Job selection & Matched records Filtered records will only be matched with the filtered records. Pick the field(s) you want to be taken into account by the Record Validation filter. If you use a reference field a suggestion will present all your inputs. The filter will only work if you click the suggested value. You can use multiple fields by clicking on the 'add filter' button. Start with - include results of records in which the Field starts with the 'Value'. End with- include results of records in which the Field ends with the 'Value'.